of reflections on the water; they move with the player. it? It would be even better to test it without any other mods. Also did you copy correct LS3DF.dll version? Mafia is an old game so there might be some issues with new hardware drivers - especially with fan made dlls. You could check DX8 to DX9 converter https://github.com/crosire/d3d8to9/releases the 1.4 version works with WS. Download dll and copy it to the game folder. Other than that it could be GPU driver issue. Widescreen fix for Mafia works perfectly. but tbth given the choice the game looks better with OM. From what I understand Your optimized mod only increases view distance and does GOLODs UDD cache patch. You can achieve same result with changing view distance in WidescreenFix.ini and it doesn't conflict with WS mod. where they would normally be? Editing cache.bin is not needed at all if you're changing distance using Widescreen. No, it only makes all of them render from start. To get sharper textures You'd have to set Anisotropic filtering to x16 in Your Mafia GPU driver profile. distance when AF is at x16. 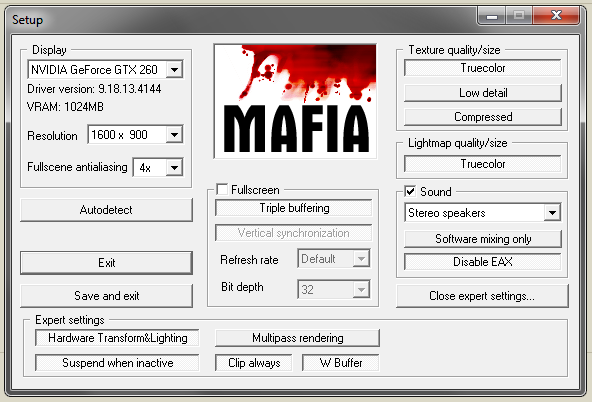 Mafia.WidescreenFix.ini and set the value I desire? 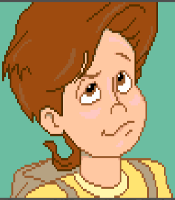 man, I just have to say that game is barely recognizable from the one from 15 years ago. I'm glad everything works. You'd have to edit scene2.bin for camera distance. WidescreenFix only allows options that are already listed there. scene2.bins; oh well you learn something every day. Can you upload the edited files for this fix? does not recognize the USB drive..
is how it looks in the game. That actually looks pretty cool..! It looks like Lost Heaven's water is polluted.